Phil Niekro | How Do I Baseball? With the news that Boston Red Sox pitcher Steven Wright will be called up from AAA Pawtucket as an injury replacement, the MLB knuckleball fraternity has increased in size to…2. The call up will have Wright joining Toronto Blue Jay R.A. Dickey, giving the AL East the quirky privilege of having all of the knuckleballers in the MLB. As I have alluded to previously, those who throw a knuckler are a rare breed and always seem on the verge of becoming extinct in today’s game. Yet, with the help of their senior brethren – Phil Niekro, Charlie Hough, and Tom Candiotti in particular – those who wish to take the bull by the knuckles horns, most often in an attempt to rejuvenate a stalled pitching career as a fastballer, do trickle in year-to-year, providing *just enough* new blood for the knuckleballer species to survive. With Wright on the precipice of attaining the goal of every minor leaguer, regardless of arm slot or pitch repertoire, let’s take a look towards the future, and see who remains to carry the torch in the minors and keep the knuckleballer blood lines alive. The oddball of this group due to his parent organization (more on that shortly), Zeller is your typical knuckleballer, in that he learned it after his pitching career floundered with a more traditional pitch selection. 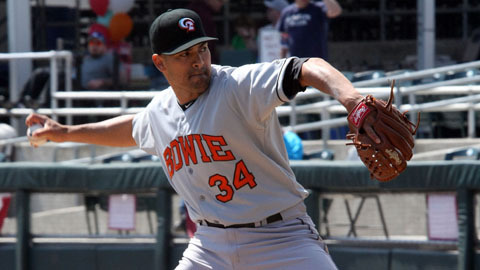 Topping out at AA affiliate Tennessee in 2012, Zeller appears to have been sent back to Class A Kane County this season to further hone his knuckleballing skill set through the mentoring of the aforementioned 25 year veteran and 216 career game winner Hough. The most inspirational story in a group of players already defined by their dedication to the game and to making the most out of their talent and opportunities, Staniewicz was recently signed by the Orioles after a tryout. Looking to get back into the game after a few years in the independent Continental Baseball League, Staniewicz sought the tutelage of Phil Niekro while serving in the Air Force Reserve, honing his knuckler skills as a member of the U.S. Military All-Star team. While still a Baltimore farmhand, he doesn’t appear to be on any of their active minor league rosters and could be getting more one-on-one attention from Niekro at the Orioles spring training facility before officially setting out on his minor league career as a knuckleballer. Another O’s farmhand, Gamboa piggybacked on to Staniewicz’ training in some ways, taking interest in the knuckling wisdom Niekro had to offer Staniewicz; having played around with a knuckleball on the side for a few years, Gamboa took to the pitch fairly easily. A non-prospect up to this point in his career in spite of solid minor league numbers, the UC-Davis product looked to the pitch as many do, as a way to rejuvenate a stalling career. By the sounds of his first outing as a knuckleballer, the future looks bright for Gamboa, even if he still requires some additional seasoning. On the surface a dying breed, the knuckleball remains alive and kicking in the minors, even with the deserved defection of one of their own to the bigs in the form of Wright. While it doesn’t enjoy the numbers and appeal as a pitching style that it did up until the 1970’s, its novelty will always be alluring to those who are looking for a way – any way – to get batters out. As the family lines are extended by the likes of the gentlemen discussed, they are nonetheless threatened by the lack of older heads to teach the pitch and keep the progeny line moving. Even with thinning numbers of knuckleballers in the game, the baseball world keeps spinning – in spite of the knuckler’s best efforts. No matter how you look at it, RA Dickey‘s career has been nothing short of remarkable. From a fireballing first round draft pick of the Texas Rangers after an illustrious collegiate career at the University of Tennessee to the knuckleballing Cy Young Award winner we see in front of us today, Dickey’s career path has been rife with detours and lessons in perseverance. Those lessons have been at the hands of the ulnar collateral ligament that he does not have in his pitching elbow – a fact learned after a team doctor noticed Dickey’s arm hanging in an odd fashion in a picture shoot for a Baseball America cover, prompting an exam, and revealing the lack of ligament. A quick table, courtesy of Texas Leaguers, shows us the ‘career’ PITCHf/x data of the 3 knuckleballers that have made MLB appearances since the technology was installed and data was offered to the public, around 2007. As you can imagine, data is scarce, not only because there are so few knuckleballers, but because the technology is so new; as an aside, it would be a real treat to see PITCHf/x data on some old timers, like the Niekros, Wilbur Wood, Charlie Hough, and Hoyt Wilhelm. Next lifetime, I suppose. On to the table! As we see, his average knuckleball velocity is quite faster than Tim Wakefield or Charlie Haeger, but I want to focus on the reasonably large disparities between Dickey’s knuckleball spin angle and spin rates. While I don’t confess to being either a PITCHf/x or physics guru, it did set off a bell in my head. Could RA Dickey’s success with the knuckleball, along with his ability to throw it with such great velocity and at the spin angle and rate he does, be a result of his not having a UCL in his pitching elbow? The UCL is a critical piece of anatomy in baseball, as it provides the lion’s share of stability to the elbow in athletic activities, like swinging a bat or throwing a ball. It is considered a valgus stabilizer, which is fancy medico-speak meaning the UCL helps keep the elbow in place, and not become displaced away from the midline of the body. If you can imagine your arms resting at your sides, it’s the UCL that prevents your arms being splayed outwards at the elbow. With that in mind, and looking at the PITCHf/x data, in particular the spin angles and rates, we can see where possibly this increased anatomical freedom at the elbow joint could provide Dickey with an advantage in throwing the knuckleball, a pitch that is notorious to master, due to the necessity of the pitcher to minimize wrist flexion in order to produce the ‘spin free’ results that are desired. Could additional laxity of the elbow joint be somehow advantageous, possibly in the deceleration phase, and give the pitch a little more oomph, not only from a velocity perspective, but also from a pitch movement perspective? I leave it as an open-ended question, and welcome smarter folks than I to provide their thoughts and input. Sometimes less can be more; for Dickey, his career less a UCL had given him more. More velocity, notoriety, and accolades than his fellow knuckler brethren ever garnered in their careers.